Every individual has a fundamental human right of having a safe, secure and an affordable housing. But the world is currently experiencing a global housing crisis. People come to large cities in the hope of getting jobs, but they don’t make enough income to have a basic house. This gives rise to deplorable living conditions, to slums. The poor cannot afford adequate housing today, or bear the increasing cost of construction and maintenance of a safe house. A similar realization was experienced by Christian Sarkar, the Co-founder of the $300 House project in Haiti after he saw people living in houses made of perishable materials. These houses had no concrete roof or floor, were extremely small in size and housed around twelve people living in a very limited space. 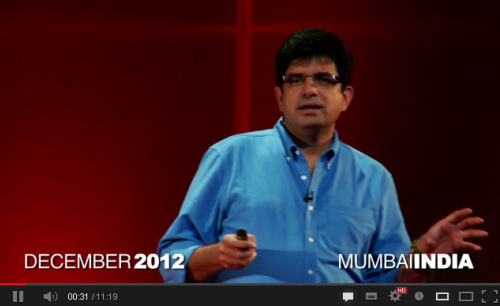 Franklin Templeton Investments partnered the TEDxGateway Mumbai in December 2012 which gave Christian Sarkar the opportunity to share this story. A marketing consultant by profession, Christian Sarkar, along with Vijay Govindarajan, Professor at Dartmouth University came up with an innovative idea of building a $300 house. A House is a symbol of good health and basic education, which inspired them to provide affordable houses to the poor. The idea was first described through a Harvard Business Review blog post and forced people to think and rethink in designing a simple dwelling that can be constructed for under $300. The idea received overwhelming response from people all over the world, and created an entire community around it who believed in it and went forward in making it a reality. For the construction purposes, the role of corporate sector was realized. But the construction of low-cost housing dwellings offer little temptation to industry and banks whose tendency is to derive maximum profit from production and investment. A challenge was outlined. That “90% of the world’s designers spend all their time working on solutions to the problem of richest 10% of the world’s customers.” To overcome this, an online open design contest was organised. The contest was hosted by German company Jovoto with, coincidentally, 300 entrants. Several interesting designs entered into the open-design challenge. After the contest, a workshop was held at Dartmouth University where selected designers and architects further sharpened their ideas. In the prototyping workshop, Jim Kim, President of World Bank said, ”The $300 house: you will hear a gazillion reasons of why it is not possible..but you have to believe it is do-able!” Today, pilot projects in Haiti and multiple locations in India are being worked upon as a result of this idea. The story of a $300 house is about the courageous individuals who actually went forward with this idea. Texan Harvey Lacey, came up with a design based on blocks built out of recycled waste. Ubuntu Box, as his idea is called, are built and assembled by the poor themselves. Lacey is adamant that the community must build their skills and their houses. His job is to teach them how. In Haiti, Lacey has showed some remarkable results, despite the naysayers and bureaucracy. Then Patrick Reynolds, and Irish-Texan, has come up with an idea he calls a “village in a container”. The houses are flat-packed into a shipping container and brought to the community where they can be assembled in a day or two. But the houses are just a part of Reynolds’ vision. He has designed and built solar-powered micro power stations and water purification systems – all portable via standard shipping containers. And Reynolds is now experimenting with low-velocity wind power generation as well. In India, a field survey was conducted to find out how a regular worker spends his day in India. Meaningful data was revealed through the survey. Using the data, a group of people in Chennai built houses which allowed families to build their stand-alone houses independent of the constraints of housing projects or utility grids. The house was affordable with innovative walls and roof technology using local materials which provided protection from extreme weather. Also, a self-organised team from Indian corporate giant, the Mahindra Group, won the corporate award for open design challenge. The team built an integrated village with civic amenities like sanitation, water, toilets, solar power and recreation areas. The project was a corporate social responsibility (CSR) project in Bihar for a community whose village was wiped out by a flood. The engineers also executed another set of projects in Pondicherry, India, where rehabilitation housing was provided to house tsunami victims. While these were not $300 houses, the team from the Mahindra Group, working in their spare time, designed a low-cost house for the rural poor. The senior management brought together various divisions of the company to rethink their initial design, and ended up building entire planned communities in rural India. So “its not just a house, its a village, its not just a village, its a life”, feels Christian Sarkar. The bottom line remains that we have to think big, believe in our ideas, remain focused and move beyond the profit-oriented approach. The idea of inclusivity should be borne in mind. The talk highlights that the point here is not to build a $300 house, but to think and find solutions for ultra-low cost housing for the poorest of poor. Our thoughts and ideas can change millions of lives. This is not about charity, rather it is giving the poor an opportunity to empower themselves. The corporate houses can make a huge difference in this by focusing on the new market for the poor who outnumber the rich. They can create products and services for them. In this process they also benefit themselves, it is the biggest opportunity for growth of corporations and at the same time reinventing a billion lives. For as Ratan Tata noted, “Companies that are not good corporate citizens, those that allow the community and environment to suffer are criminal in today’s world”. Ayushi Srivastava holds a Master's in Environmental Studies at the University of Delhi and has been associated with Delhi Greens as an intern with the Delhi Greens Blog project.